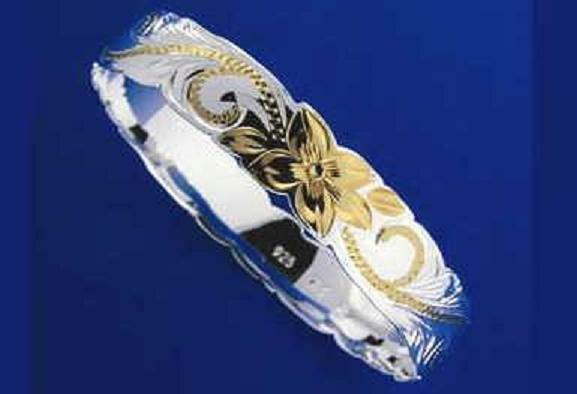 SILVER 925 HAWAIIAN BANGLE BRACELET PLUMERIA MAILE LEAF LEAVES LEI 8MM 2 TONE 9"
Width: 8mm (5/16"). Thickness: 1.25mm. Design: hand engraved Plumeria and Maile leaves with scallope (cutout) edges 2 Tone. Stamp: 925. Approx 15.7 grams. Width: 8mm (5/16"). Thickness: 1.25mm. Design: hand engraved Plumeria scroll with smooth edges. Stamp: 925. Approx 12.1 grams. Width: 8mm (5/16"). Thickness: 1.25mm. 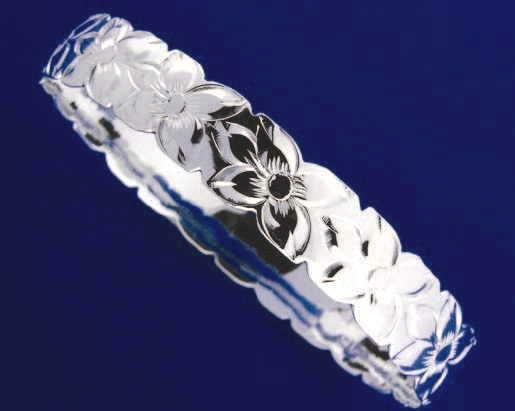 Design: hand engraved Plumeria scroll with smooth edges. Stamp: 925. Approx 13 grams. Width: 8mm (5/16"). Thickness: 1.25mm. 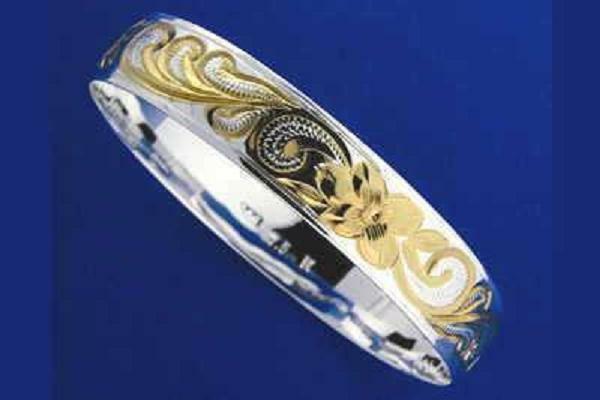 Design: hand engraved Plumeria scroll with smooth edges. Stamp: 925. Approx 14 grams. 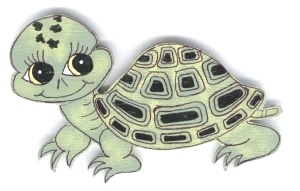 Width: 8mm (5/16"). Thickness: 1.25mm. Design: hand engraved Plumeria scroll with smooth edges. Stamp: 925. Approx 14.8 grams. Width: 8mm (5/16"). Thickness: 1.25mm. Design: hand engraved Plumeria scroll with smooth edges. Stamp: 925. Approx 15.7 grams. Width: 8mm (5/16"). Thickness: 1.25mm. Design: hand engraved princess Plumeria scroll with scallope (cutout) edges. Stamp: 925. Approx 12.1 grams. Width: 8mm (5/16"). Thickness: 1.25mm. Design: hand engraved princess Plumeria scroll with scallope (cutout) edges. Stamp: 925. Approx 13 grams. Width: 8mm (5/16"). Thickness: 1.25mm. Design: hand engraved princess Plumeria scroll with scallope (cutout) edges. Stamp: 925. Approx 14 grams. Width: 8mm (5/16"). Thickness: 1.25mm. Design: hand engraved princess Plumeria scroll with scallope (cutout) edges. Stamp: 925. Approx 14.8 grams. 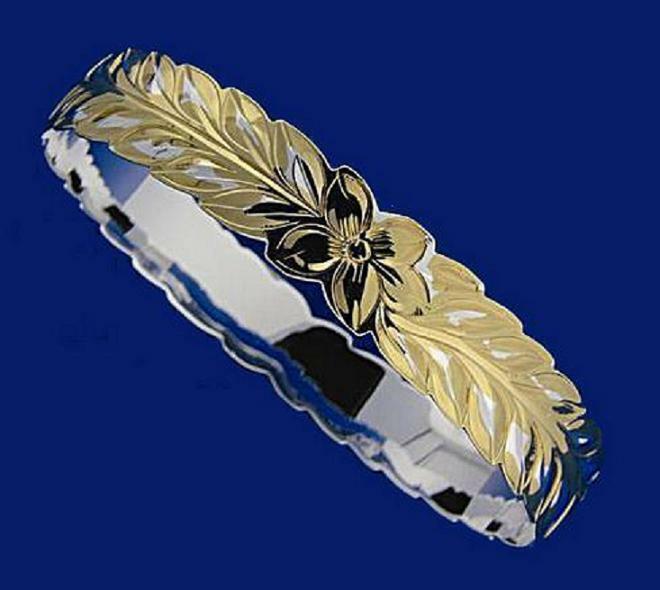 Brand new solid sterling silver (not plated, not bonded) Hawaiian fancy Plumeria flower bracelet. Length: 7 1/2" plus 1/2" extension. Flower size: 10mm (approx. 3/8") in diameter. Petal design: polish edge around brush finish. Weight: approx. 9.1 grams. Stone: (CZ). Stamp: 925. Rhodium finish so it has the white gold look. 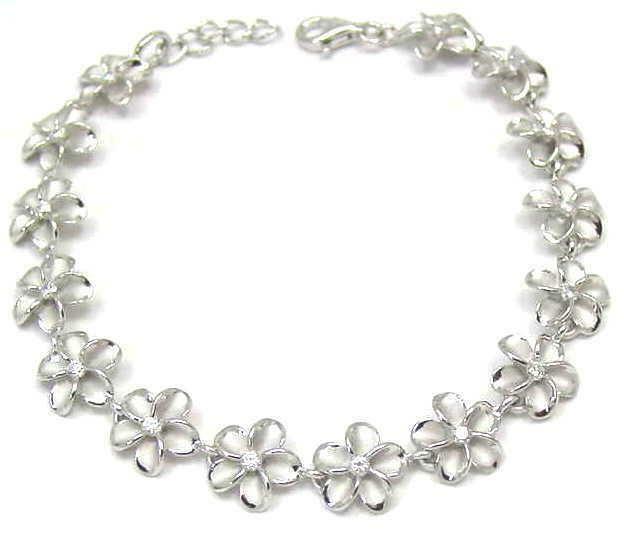 STERLING SILVER 925 HAWAIIAN PLUMERIA FLOWER LINK BRACELET CZ 15MM 7 1/2"
Flower size: 15mm (approx. 5/8") in diameter. Length: 7 1/2" + 1/2" extension. Weight: approx. 13.3 grams. Stone: Cubic Zirconia (CZ). Stamp: 925. Size: 7". Weight: approx. 6.5 grams. Thickness: 1.25mm. 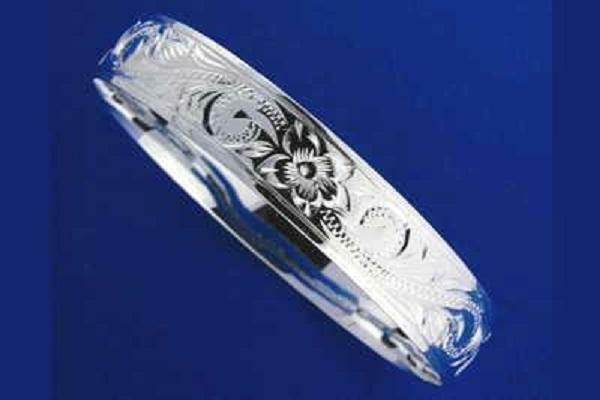 Design: hand engraved Plumeria scroll with smooth edge. Stamp: 925. Width: 10mm (approx. 3/8"). Thickness: 1.25mm. Design: hand engraved Plumeria all around with scallope (cutout) edges. Stamp: 925. Approx 16.2 grams.